A delightful cottage situated only a minutes walk to the centre of town and a couple of minutes walk to the beaches. The cottage has just been fully refurbished for the 2013 season and includes a living/dining room, fitted kitchen with dishwasher, washing machine, fridge freezer and integrated oven. 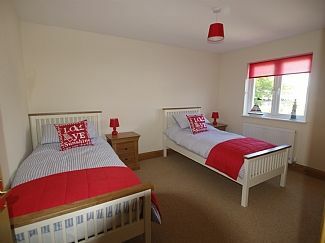 A ground floor bedroom with a Jack & Jill shower room, 2 twin bedrooms and a family bathroom to the first floor. The property has free Wi-Fi and sky TV in the living room. The rear enclosed patio area has a back gate which leads directly to Sainsbury Supermarket and to the public parking areas. A travel cot and high chair are also available. There are 2 bathrooms, one on the ground floor which has a WC, handbasin and Power Shower serving as a Jack & Jill ensuite, the other bathroom is upstairs serving as the family bathroom with a Power Shower over the bath, WC and hand basin. The living room has 2 large sofas, dining table for 6, sky tv, DVD player, internet access, a selection of books and DVDs . Kitchen contains gas hob and electric oven, integrated fridge freezer washing machine and dishwasher. There is also a tumble dryer located in the rear shed. Tenby golf club is only 5 minutes walk away. The green fees are quite reasonable and the club house is a lovely place to have a meal and relax for an hour. Master bedroom and ensuite is on the ground floor as is the lounge and kitchen. Notes on accommodation: A delightful cottage located only a minutes walk into the centre of town and a couple of minutes walk to the beach. Outside: There are patio doors leading onto the enclosed patio area to the rear of the property, there is also a rear door leading from the kitchen area. The rear patio is extremely large. Utility Room: Integrated Washing machine located within kitchen, there is also a tumble dryer located in the rear shed. Cleaning / Towels / Linen / Maid service: All bed linen and towels for the house are included. Other: gas hob/stove, oven, fridge freezer, microwave, dishwasher, washing machine, tumble dryer, iron/ironing board, hair dryer, sky TV, Internet access, central heating, travel cot, high chair, patio area, BBQ. Lovely cottage, comfortable and well equipped. Location brilliant close to all local amenities. Great stay in Tenby. Gorgeous weather, lovely seaside town with plenty of places go and a fab well located cottage. A wonderful cottage, spacious, clean and comfortable with just minutes walk to beaches and restaurants etc. The cottage is well equipped with everything you need for your stay. Stayed in this cottage recently with my family aged from 12 to 69.Great location,short walk to beach and the town,with easy access to local supermarket. Very clean cottage,ideal for families, much larger than it looks from the exterior. Enjoyed our stay and would recommend it to friends. I parked in the multi storey at the bottom of garden at a cost of 28 pounds for the week. Lovely clean modern home in a great location within Tenby. Covered parking is available at the multi-storey car park behind the garden at the back of the house and you can purchase a ticket for the week for £18 although you will need to have it in change! Shops, beaches and restaurants literally at the end of the road and our girls loved the range of shops available in Tenby. House is lovely and the rear seating area is a sun trap and we enjoyed several meals out there when the weather was sunny. There were also some sun loungers in the shed which were much appreciated! Everything and more you need for a lovely holiday! Great place to stay very convenient for the town.easy 2 minutes walk to shop and pubs .Great friendly town. Tenby is really a beautiful town, it has quaint streets with cobbled stones, a thriving tourist area with something to suit all ages and tastes. The town has some amazing quality shops and cafes and restaurants. The beaches are safe and clean for swimming meaning its great for families with young children. Tenby has an active working harbour which has loads of options for sailing, surfing, wind-surfing, fishing trips and the famous boat trips to Caldey Island operating daily. The town is now an all year round holiday destination and is well placed for exploring the Pembrokeshire coastal path, Folly Farm, Heatherton, Oakwood and the many varied tourist attractions nearby. The famous South Beach is at the end of the road literally with Tenby Harbour, the North Beach and Castle Beach 3 minutes walking distance. Tenby has five award winning blue flag beaches. Saundersfoot 3 miles, Pembroke 10 miles, Carmarthen 27 miles, Cardiff 90 miles, London 256 miles, Heathrow to Tenby 4 hrs, Bristol Airport to Tenby 2.1/2hrs, Cardiff Airport to Tenby 1.1/2hrs. Castle cottage is central to everything in Tenby, the medieval town walls are visible from the front door. You can unload outside the cottage on arrival/departure with ease. Sainsbury's supermarket is 1 minute away. A Tesco Metro supermarket (open from 6am - 10pm) is a 2 minute walk, so no panic if you run out of anything. There is a wide selection of cafes and restaurants to suit all pockets and tastes - from excellent fish and chips, classic pub food, Indian restaurants and one or two high quality restaurants.